Single patty cheeseburgers only. Coupons not required. 1/2 price shakes after 8PM all summer long. Sonic is celebrating National Hot Dog Day all day today, visit them and get 6 inch hot dogs for only $1. Print out the whole page or mention coupon when ordering. Receive 50¢ Corn Dogs all day. Valid at participating Sonic locations. - Free medium natural cut fries with purchase of Chicken sandwich, Spicy or Original. 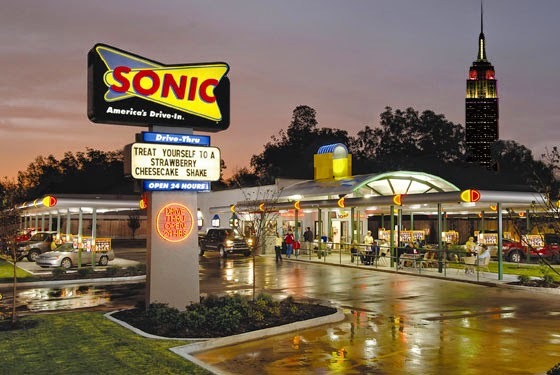 If you’re in the mood for diner classics with modern service, head to Sonic Drive-In. There, you can enjoy burgers, shakes, and Slushes served to your car in one of their drive-in parking spots or at their outside dining area by one of their popular carhops. Save money on the Sonic experience with our printable coupons.